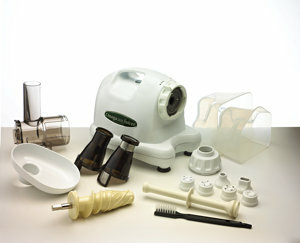 If you’re interested in purchasing a highly efficient juicer that will not only make you fresh juice from fruits and vegetables but also help you make nut butter, baby food, and grind coffee, we recommend that you consider purchasing the Omega J8003 Nutrition Center Single-Gear Commercial Masticating Juicer. The Omega J8003 is a single-gear masticating juicer whose processing speed is just 80 RPMs. Most commercial juicers on the market have higher processing speeds (1500 – 5000 RPMs). Due to its low speed of operation, the Omega J8003 is also called a low speed juicer. The relatively low speed of operation ensures maximum extraction of juice from fruits, vegetables and leafy greens. This is something you don’t get with other normal commercial centrifugal juicers. Let’s start this Omega J8003 Masticating Juicer Review with the pros. – The Omega J8003 Juicer uses a dual stage juice processing system which ensures that the maximum amount of juice is extracted from fruits, vegetables and the leafy greens that you feed in. The dual stage processing system consists of a crushing of the ingredients until maximum juice is extracted followed by a squeezing action on the leftover pulp. This ensures that you get the maximum juice possible. With centrifugal juicers, it’d nearly be impossible for you to juice leafy greens. The dual stage processing system in the Omega J8003 makes juicing leafy greens extremely easy. – There’s a reason why the Omega J8003 juicer has a low speed of operation. The low speed not only ensures increased juice extraction but also prevents oxidation thereby allowing your juice to be stored longer (up to 72 hours). With centrifugal juicers, there’s a chance of healthy enzymes being killed. The low speed of operation in the Omega J8003 juicer preserves and maintains healthy enzymes. – Cleaning can be quite a chore with juicers. There are many juicers in the market that have large parts with narrow openings which make it extremely difficult to clean. It isn’t the case with the Omega J8003. Cleaning is extremely easy because of the smaller parts and wide openings. It just takes a couple of minutes to clean the entire unit and have it ready to make you another fresh batch of juice. – The other thing that makes the Omega J8003 Juicer stand out is its noise level. The Omega J8003 produces very little noise while running. If you’re someone who’s used to the noise of centrifugal juicers, you’d be surprised when you begin using the Omega J8003. – One of the main cons of Omega J8003 Nutrition Center is the small feed tube. It’s nearly impossible to feed large chunks of produce into the feed tube directly. As a result, you’ll need to slice fruits and vegetables into smaller pieces before you can feed it into the juicer. This can be a hassle if you’re on limited time. – The Omega J8003 doesn’t juice as fast as the centrifugal juicers. With centrifugal juicers, juicing would take just a minute or two. But with the Omega J8003 juicer, you’ll have to wait for at least 8 – 15 minutes for your juice to be ready. Well… if you’re someone who’s looking to get the maximum value from your organic produce and would like a juicer that can effectively do leafy greens, we strongly recommend that you go ahead with the Omega J8003 Commercial Masticating Juicer.